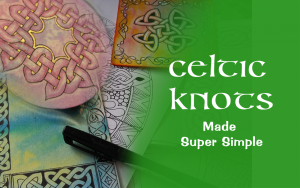 I have been having fun playing along with Kiala Givehand’s Journey Within December Mini-Course and Blog Hop! 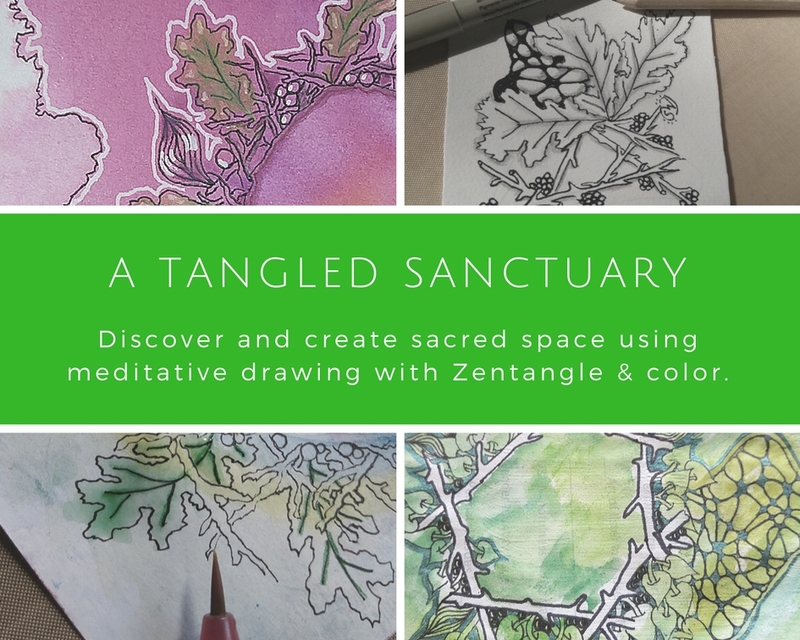 There’s nothing like some art journaling to get your creative juices flowing again (and of course, Zentangle!). With two challenge pages under my belt, I’m hooked now, and I can’t wait to give you all AND Kiala the challenge/prompt for December 17! Just when I thought I’d take a break for a couple of days, Tiare Smith posted her Watercolor Splotch Challenge . While I haven’t yet taken Tiare’s class, I thought I’d take a stab anyway, coz I LOVE watercolor! And it seemed a good excuse to sneak in some very subtle tangling as well, so here’s my very quickly and loosely done ‘flowery forest’. 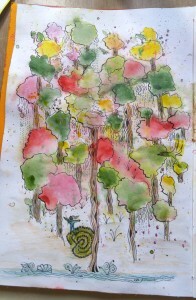 I added in some loose bits of the Diva Dance tangle for the tree trunks and some Msst. I still felt it needed something else. Bring in my tiny lady of the labyrinth! 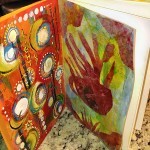 Are you looking for a year-long FUN way to art journal all year long? AND also make 12-13 of your own journals over the next year? 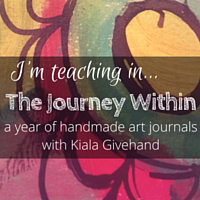 Then sign on up for the Journey Within 2016 online course with prompts and techniques from over 19 artists (including me!) HERE! 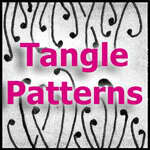 And don’t forget to check MY Dec 17 blog hop prompt right here! And there will be some GIVEAWAYS, so subscribe to the blog or the Facebook page! This entry was posted in Art Journal, Art Workshops, Book Arts, Challenges, Labyrinths, The Journey Within, Zentangle® and tagged art journal, art journaling, The Journey Within, watercolor. Bookmark the permalink. Love your splotch art tree and tangle. Fun! Thanks for sharing. Thanks, Tiare! It WAS fun… loose and flowing is one of my favorite modes! Thank you for a great prompt!